These are the first ever black and white portraits that I photographed with an old Pentax camera when I was just 15 years old. I loved photography and art back then, and I still do and I was so fortunate as my school had the most wonderful Art Department with professional artists teaching photography. My teacher, who was also a professional photographer and screen printer taught me how to develop my own black and white film and to print my own images. I just loved it so much and who knew where it would take me. These images marked the very beginning of my career, I took so many more images whilst I was at school and I remember spending most lunch hours in the darkroom printing out my pictures. 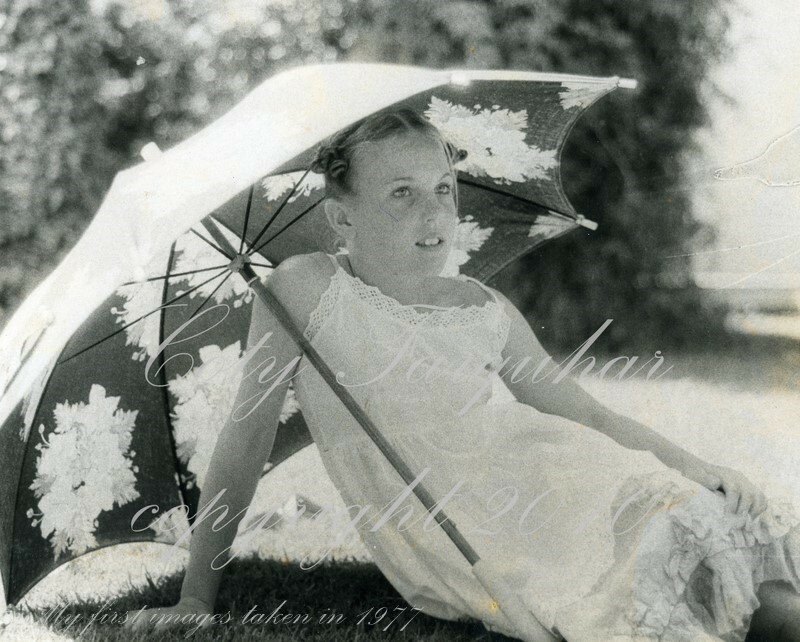 I can still remember the smell of the photograph chemicals and coming outside with all my wet picture to hang and dry. 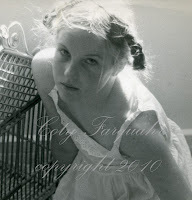 This small collection of images I took of my younger sister Caroline modeling around our home. She was the perfect model back then and even then I was "Little Miss Art Director" directing and styling her every move. I dressed her in our Grandmother's hats, used props from around the house and I found these lovely little white linen petticoats in the dress up wardrobe at school. I dressed Caroline in many different outfits that day and I remember telling her what to do for me in front of the camera. It was 33 years ago and I can still remember everything about the day the weather and how excited I was to be creating these images. Unfortunately many of the other images from this shoot are gone, I wished I had printed them all. These prints are so old now and they are marked with yellow stains & scratches from the years. I have lost the original film so this is all I have left. I found these photographs at Caroline's home a couple of years ago and she had somehow ended up with them after all these years, thank goodness. 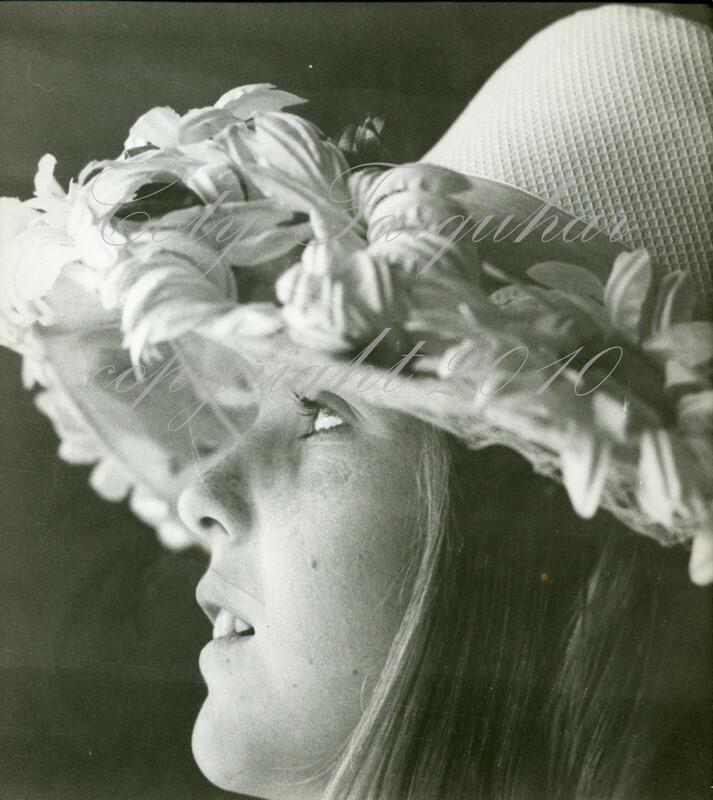 and my Grandmother's hat above was the hat that I also wore on my wedding day, see here(something old.....something new..) which we covered in many more daisies and a yellow veil. Oh, Coty! Now we have evidence that your artistic gifts were evident when you were barely more than a child. It was fortunate indeed that your school provided the nurturing environment that encouraged your innate creativitity. Thank you for sharing these beautiful images. They're pure magic! I am not surprised ... your photographic and artistic skills are natural talents.... always waiting for you to pick up that camera!. I'm so glad your school had photography and printing.. incredible really for back then.. and I am allowed to say that!!! as I too was 15 in 1977. Dear Coty....thank you for sharing such intimate and dear photos! my favorite is the one with her profile and the hat on.....you can definitely see your passion through your lens, even at such an early age!! Thank you for visiting me yesterday, and a friend's gathering prevented me from posting B&W Sunday, but I will do it next Sunday, and will link this post here, if you don't mind still. They are really beautiful. 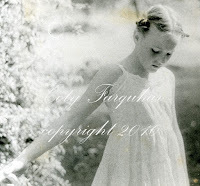 I got married that year and I also remember that in Europe at least it was the photographer David Hamilton who was a rising star and those years were romantic years. Your work has developed and is very inspirational. Thank you. Coty-Some people are just born with it I guess! I love that not only were you photographing you were styling with a much older soul :) It's always a pleasure to visit! talent is something that is ingrained in a person and you've always had "it." lovely images. Wow...you took these at age 15? That's amazing! They are so beautifully done! True treasures! They are so classic. Just as lovely today, maybe more so as the first masterpiece from someone who develops a passion for something is always the most special. Actually it shows how authentic you have always been to your style. As always, your blog is my mini vacation. Oh Coty, wow, tremendous photography. These photographs not only capture the decade but there is something other, a soulful timelessness to them as well - the one with the light through the window, framing the girl is beautiful as well as the portrait. I adored developing my own black and white prints as a teen. It is like being underwater - in red!